When this holiday season began, one of the first carols I heard on the radio was a humorous parody of the Twelve Days of Christmas. That parody made me start thinking about twelve things we could do for our gardens for the coming year – things that will make them healthier, more productive, and more of a place to just enjoy. Our gardens don’t need Lords a’ Leaping, and I don’t know what on earth I would do with Maids a’ Milking, so here is my nod to the Twelve Days of Christmas, garden style. If there was only one thing I could do for my garden, this would be it. Compost is a basic building block. It is hard to find anything that works so many ways. Compost builds soil, improves soil texture, supports the Soil Food Web (where magical things happen) and provides an essential element for life – carbon. Compost can be added several ways. One of the most common ways is to add finished compost as a top dressing before mulching. Compost can be added during bed prep when building raised beds. 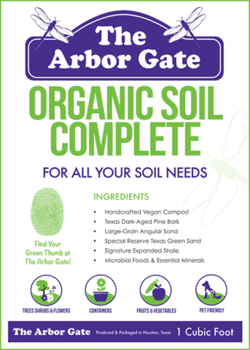 One of the best ways to do this is to use a compost-based all-purpose soil like Arbor Gate Organic Soil Complete. I love this soil so much that I have started buying it a yard at a time in super sacks. I began foliar feeding almost ten years ago. I did it to improve the health and to extend the summer production of my tomato plants. The results surprised me. I had more production, longer production, fewer disease issues, and almost no pest trouble. That made me really take a look at using foliar applications for the rest of the garden. After doing some research, including reading all of the naysayers, I decide to apply the use of foliar feeds pretty much garden wide. I’m convinced it is good for your entire garden. 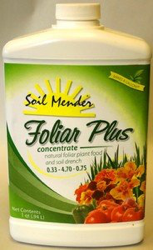 There are several different recipes for foliar feeds, but the simplest way to approach it is to just use natural, sea-based products that include minerals and other natural components like compost tea and molasses. I also add a little EM-1 at least once a month to provide a probiotic benefit. Probably every one of you knew mulch was going to be in the top five. Mulch is good for every garden, but it is an imperative for a Gulf Coast garden. Mulch is a triple whammy– moderating soil temperature, reducing moisture loss, and suppressing weeds. You can multiply the benefits of mulch by carefully choosing the materials you use. 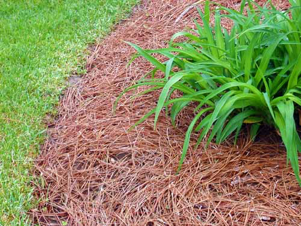 Native mulch, fallen tree leaves, and pine straw all have one or more characteristics that make them the “perfect” mulch. The first two decompose over time and add to the soil like compost does. Spreading these materials over the garden is a form of sheet composting. It mimics the forest floor where beneficial fungi work in concert with nature to keep plants and soil healthy. Pine straw also decomposes, but it isn’t a soil builder like the first two. The advantages of pine straw are the fact that it stays loose and airy. It can be pulled right up to the stems of plants, where other mulches should not be. It looks wonderful, like a soft brown carpet, and it smells wonderful when the sun warms it. I receive pictures attached to garden questions every week. Usually the question is about a pest or disease issue, but in the course of studying the pictures for a diagnosis or identification, I often notice that the plant also looks hungry. The leaf coloration or condition will give me a clue that there is a deficiency. I can’t always tell what the specific deficiency is, but I can certainly tell there is one (and no, all those memes on Pinterest don’t accurately diagnose deficiencies). You don’t need a soil test every time you see signs of a deficiency. If you provide natural, organically-sourced nutrients to your garden, plants will seek what they need, when they need it. The lower macro-nutrient numbers in slow-release organic fertilizers like Arbor Gate Organic Blend are a huge advantage to gardeners. These are replacement quantities – putting back what plants have used so it is available again. I’m very good about regularly fertilizing my vegetables and fruits. I could be better about the rest of my garden. Where do I begin? Cooking with your own fresh, organic herbs is a chef’s treat. But even if you never cook, you still need herbs in your garden. Herbs are healers and providers. Some of them actually heal the soil. Basil, for example, emits a root exudate (RA) that inhibits phytophthora, a common root rot that attacks a wide range of plants. Others attract pollinators and predators – two groups of insects that do a lot of heavy lifting in the garden. You can interplant herbs throughout your garden, or you can dedicate spaces for herbs in groups depending on their uses – culinary, medicinal, craft. You can set aside a garden space as an Insectary Garden – a permanent herb garden designed to provide the year-round needs of predatory & pollinating insects. You can also plant herbs at the feet of fruit trees. Many herbs are shallow rooted and do not compete with the fruits. 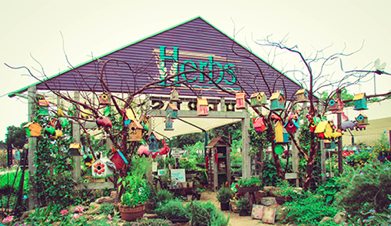 If you are looking for a lower maintenance garden, the herb house is your first stop. Herbs are seldom bothered by pests, they are not heavy feeders. Many have attractive flowers or fragrance. Mounding herbs can be planted at the feet of shrubs that tend to get leggy, like roses. They make great companions, each adding to the attributes of the other. It’s easy to let pruning get away from you. But it is an important task in the garden. Pruning is a restorative activity. It redirects growth hormone and creates a fuller plant with more youthful and vigorous growth. Many shrubs and perennials look and perform better with regular pruning. Some plants require pruning for production or to promote flowering. Skipping pruning, or pruning at the wrong time, can lead to fewer flowers, lower production and more problems – like overcrowding or disease issues. It takes a little time to learn to prune everything correctly. 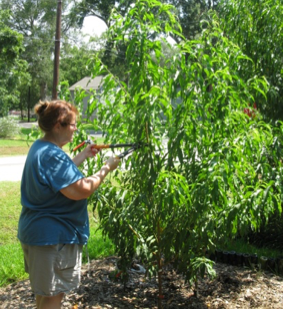 You learn to prune by taking classes when they are offered, by reading, and by observation. Thankfully, plants are pretty forgiving. If we make a mistake in pruning this season, there will be plenty of new growth next season. A great place to start will be the classes offered on Fruit Culture Day at The Arbor Gate. This educational day happens the last Saturday in January. There are at least two classes that will address pruning – the tools, the timing, and the methods. There are so many reasons we should thin fruits. Thinning will increase fruit size and table quality, improve crop consistency (reduce alternate bearing), prevent structural damage, improve the general health of the tree, and increase longevity. Many trees will set more blooms the following year as a result of thinning. Thinning is not difficult, physically. The hurdle most of us have is psychological. It is difficult to remove what looks like perfectly good fruits! If it is difficult for you, just keep all of the benefits in mind as you thin. 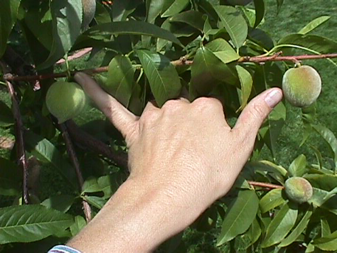 Thinning should be done when the fruits are between ½” and 1” diameter – no larger; thinning after the fruits exceed 1” results in less improvement in size and flavor. Leave approximately 4” – 6” between apples, peaches, and pears. Leave 2” – 3” between plums. You can use your hand as a measuring device. The average hand is approximately 6” long and 4” wide. Just move down each branch, thinning as you go. Citrus also needs to be thinned, especially on a young tree that is just coming into bearing. Citrus often sets more fruit than it can support. Wait until at least a month after petal fall. Citrus will naturally drop some of its fruits about that time. After the fruit fall, remove approximately every third fruit. Water in the garden is wonderful! It is sound, it is motion, it is gentle energy, it is soothing and it is meditative. Size literally does not matter – just that the water is moving and clearly visible to resident and visitor alike. Wildlife also prefers moving water. It is never stagnant, so it remains fresh and does not support mosquito breeding. I added this to my list because I have had several water features in my garden for a long time, but none of them is meant to be a relaxing feature just for us. They have all been designed to support water plants and wildlife. 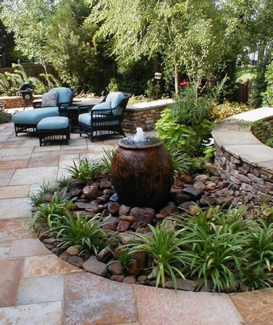 One of the twelve things I can do to improve my garden is add a water feature just for pure enjoyment. This is another difficult task for some gardeners. We all have plants that we have carefully collected and cared for that require more time & attention than we should invest. It’s hard to think about just ripping them out, but it needs to be done. These are the plants that often have pest & disease issues, demand excessive attention or inputs, or just don’t perform the way they should. Make note of why you chose the plant in the first place – color, size, texture, evergreen, bloom? 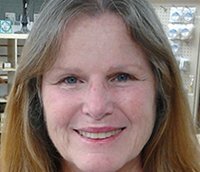 Visit with the nursery to find a better replacement that has the same features. There is ALWAYS a replacement option! Once you have chosen a new plant, it will be easier to remove the “problem” plant. We should all keep an editor’s eye on our gardens off and on; they will be better for it. There are SO many vegetables to try! I have had the privilege to garden and visit with gardeners from many cultures. They often mention a particular favorite squash or green that I have not tried. It’s become a tradition that we try something new every year. Truthfully, we often try more than one new thing! I plant our tried and true family favorites, but we try at least one new pepper and tomato every year. We love Asian greens, and that is a plant world of its own. Not every experiment is successful, but over the years we have found a lot of keepers. When you make your seed list this year, or visit the nursery when the veggies come in each season, let everyone in the family choose something new to try. It’s at least good for bragging rights at the kitchen table! 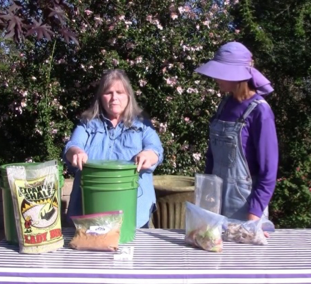 These indoor methods of composting will take your soil building program into overdrive. They are both methods of turning household waste into garden gold while reducing your own load on the municipal waste stream. It is the perfect example of a win-win activity. Vermicomposting uses compost worms to process waste. They are digesters of paper and food waste, and a few odd things from relatively chemical-free homes such as dryer lint, vacuum cleaner dust, and hair from the brush or drain. Bokashi Composting allows you to process pretty much all other household waste including things that cannot go into outdoor bins or the Vermicomposter – dairy, meat, fish, or bones. Both of these methods produce extremely high quality compost that is microbe and nutrient rich. They both turn this waste around quickly so it can be used to enrich garden and potting soil. Both methods are easy, inexpensive and require no special equipment to get started. Yes, there might be other things we could add to our twelve days inspired list that seem more important than a sunflower, but sometimes we just have to do something for the pure joy of it. Sunflowers are just that – pure joy. There are tall sunflowers that seem to reach for the sky. There are dwarfs that cluster with their little faces raised to the sun. There are large sunflowers and small sunflowers and everything in between. There are sunflowers in every shade of yellow, and even sunflowers that are brilliant red and warm mocha. I will plant more of them this year just because they make me and my husband smile. He even likes the huge common ones that come up here and there where the birds plant them. We just leave a few of them when we see them come up in the spring. They aren’t really hurting anything and they will make the birds happy in the fall when they go to seed. Sunflowers do have some beneficial effects. They are “hyperaccumulators” – they clean heavy metals and toxins out of the soil. Sunflowers are a great trap crop for Leaf-Footed Bugs (stinkbugs), keeping them away from your tomatoes and green beans, making them easier to catch and dispatch. 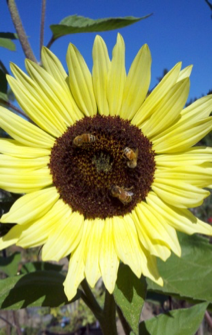 The bees love sunflowers, and they are a good pollen source. There just isn’t anything bad about a sunflower. I confess, it was hard to pick just twelve things! But the song says twelve days, not 13, or 14, or 15. So I will leave chatting about milk & molasses and some new ways I have found to keep birds off my fruit for another blog. May the blessings of this season find their way to your door. May joy fill the hearts of those you cherish. I wish you health, and happiness, and many fruitful hours in your garden in the new year to come.